Morus. (From Latin morus, mulberry.) MULBERRY. Moraceae. About 12 species of fast-growing, short-lived, deciduous, monoecious or dioecious trees and shrubs to 20m. Crown dense, rounded, often rugged; bark brown, rough, often burred. Shoots green soon becoming brown; exuding white latex when cut; buds ovoid-conic, 3-6 outer scales, terminal bud absent; stipules small, caducous. Leaves alternate, distichous, mostly cordate and serrate, simple or 2-5-lobed, turning yellow in autumn, venation sub-trinerved; petiole short. Inflorescence of bracteate unisexual catkins in leaf axils, green, short, capitate, calyx membranaceous, in male divided into 4 imbricate segments, 4 tepals, conate at base, 1 stamen, filaments free, inflexed in bud, pistillode present; in female ovary enclosed within calyx, ovoid or subglobose; ovule solitary, pendulous, 2 stigmas, linear-subulate, sessile or on a short style, subequal in length, the calyx becoming succulent in the fruit. Fruit superficially resembling a raspberry but structure differs: 20-100 per catkin, closely packed but separate, drupaceous, enclosed in persistent fleshy calyx forming a syncarp, green at first, ripening through orange or white to red or deep purple; seed within testa; ripe late summer to mid-autumn of same year. W N America and S Europe east to Japan, south to lowland tropics in C Africa. The mulberry belongs to the same family as the fig, the Moraceae. It is the black mulberry, Morus nigra, that is prized for its fruit; that of the white mulberrty, Morus alba, is condsidered more insipid but the leaves of this species are renowned as food for silk-worms. It is thought to have originated in China where for over 5000 years it has been grown and used in silk production. The black mulberry’s origins are not precisely known but it is likely that it came from the Caucasus or possibly from mountainous regions further east. Both the black and the white mulberry were grown in Mesopotamia and ancient Egypt and the mulberry is mentioned several times in the Bible. It spread to ancient Greece and Rome and then, with the Roman legions, across Europe to Britain and subsequently to many other parts of the world. Another species, Morus rubra, is native to the northeast United States. The black mulberry would almost certainly have been planted in Britain by the Romans and since the trees are slow-growing and can be very long-lived (several hundred years) it is possible that some specimens survived from Roman times until the Middle Ages. The tree can attain a height of 9m or more, with attractive gnarled bark and spreading head. Very old trees can occasionally be seen and attain most unusual, artistic outlines. There are a number of references to mulberries from the 13th century and the Tudor period. James I tried unsuccessfully to encourage silk production, even establishing a mulberry garden on the site now occupied by Buckingham Palace. Many thousands of trees were planted, but they were all Morus nigra, which proved to be unsatisfactory for silk production. The growing of mulberries in Britain subsequently declined and the trees have long since been planted as much for their decorative effect as for any culinary use. In other parts of the world the black mulberry has long since become established and popular. It is quite widely grown in Australia, South Africa and southern Europe, in those regions where the climate is reasonably cool and temperate and with winters that will satisfy the tree’s comparatively high chilling requirement. Some seedless cultivars are now grown in Iran and neighbouring areas. Named western cultivars include ‘Cooke’, ‘Chelsea’, ‘Illinois Everbearing’ and ‘Wellington’. ‘White’ is white-fruited and therefore non-staining. If fruit production is the primary aim it is important to obtain a selection known for its large, juicy fruits since many exist that produce only small, seedy fruits. In many parts fo the Mediterranean, like Greece, mulberries are commonly used as street trees, being severely pollarded every spring to produce long stiff branches with large shade-producing leaves. The flowers are unisexual and are carried on inconspicuous catkins. The trees are self-fertile. Leafing and flowering is late, normally with little risk of frost damage, but leaf-fall is often early, the foliage soon succumbing to the first autumn frosts. Even in warm climates the tree is therefore bare for a large part of the year but its bark and shapeliness are the compensation. The fruit is actually formed from a cluster of individual flowers, each ultimately forming part of the whole collective fruit. At first green it gradually turns to pink, then red and finally to deepest crimson, almost black. The juice stains badly and is particularly difficult to remove. Trees for fruit should be planted in a sheltered, sunny situation in good soil conditions and preferably with short grass beneath to aid harvesting; in colder climates spring planting is advised to take advantage of a warming soil. Only is southern Britain is success likely; further north wall protection, using fan-trained trees, is recommended. Specimen trees will require sufficient headroom to allow for cultivations beneath them and support for half-standard or standard form is wise until the tree is firmly rooted. Small trees can be maintained in large pots or tubs using a high-fertility soil-based medium. Any pruning should be done in winter merely to keep tree shape and to avoid crossing branches but kept to a minimum because of the tree’s propensity to bleeding. Should any large cut continue to bleed, it should be cauterised with a red-hot poker. Roots are similarly vulnerable should larger ones happen to be broken. The fruit ripens in late summer and should be used immediately as it is very soft. That from a good selection will be equivalent to a large loganberry in size. Fruit can either be gathered up from short-mown grass or shaken on to sheets to ensure cleanliness, and has a number of culinary uses including jam, colouring and flavouring other preserves, and also for making wine. The ripe fruit is sweet yet with marked underlying sharpness. Nutritional needs are minimal unless soil conditions demand occasional applications of a compound fertiliser (preferably one higher in nitrogen) at 4.5-5.0g/m². Mulching of newly established trees is recommended and irrigation is essential during dry periods. Propagation is either by layering in autumn or more usually by hardwood cutting of well-ripened young shoots approximately 18cm long with a heel of two-year-old wood. These are taken either in autumn or early spring and are inserted in a shady border or in a cold frame with all but the top 5cm below ground. Seedlings take too long to mature; grafting is difficult because of excessive sap flow (bleeding). Quite large branch portions will take root in the open under favourable weather and soil conditions. Bacterial blight (Pseudomonas mori) results in small, angular, black spots on the leaves and lesions on the shoots which can cause dieback. Affected shoots should be removed and burned in the autumn. Small, dark brown leaf spots on which black pycnida appear are caused by the fungus Phloeosporella maculans. Regular sprays with a copper-based fungicide may be needed to control both of these diseases. Canker and a resultant dieback of young shoots is caused by Gibberella moricola (also sometimes identified as Gibberella baccata); red pustules of Fusarium spores (the conidial state of this fungus) form on the dead twigs and around the edges of the cankers; affected shoots should be cut out. Mulberry may also be affected by coral spot (Nectria cinnabarina) and powdery mildew (Phyllactinia crylea). The principal pests are birds, against which netting may be essential. WHITE MULBERRY. Tree to 16m, crown rounded. Young shoots downy at first, glabrous by autumn. Leaves 8 x 6-20 x 12cm, broad ovate-cordate, margin coarsely dentate, apex rounded to acute, often bi-lobed or tri-lobed with irregular sinuses; glossy light green above, glabrous beneath except for veins; petiole 1-2.5cm. Flowers pale green cylindrical heads 8-14 x 6mm on a 12mm pedicel; stigma sessile on female flowers. Fruit clusters 1-2.5cm, green-white ripening pink to dark red; sweet but weak flavour. China. Z5. ‘Aurea’: leaves and bark yellow. ‘Chaparral’: vigorous growth; branches slender, drooping; leaves bright green; no fruit. ‘Constantinopolitana’: compact, thickly branched tree; leaves ovate, to 15cm long, leathery, coarsely serrate, dark green and glossy above, lighter beneath. ‘Fegyvernekiana’: dwarf, to 80cm. ‘Fruitless’: sterile, fast-growing, to 18cm, crown rounded; leaves oblong-acute, glossy. ‘Kingan’: sterile; suitable where fruit drop may be a nuisance. ‘Laciniata’: leaves deeply lobed and toothed. ‘Macrophylla’: leaves mostly large, 20 x 15cm. ‘Multicaulis’: suckering shrub; leaves to 35cm; fruit nearly black when ripe. Probably more than one clone involved. ‘Nana’: habit dwarf, shrubby, rounded; leaves regularly lobed. ‘Nigrobacca’: fruit ripens dark purple. ‘Pendula’: shoots hanging; crown weeping if trained or grafted high on stem of type. ‘Pyramidalis’: conic. ‘Stribingii’: male flowers falling early; no fruit. ‘Venosa’: leaves slender-tapered, with conspicuous pale downy veins. variety tartarica. Leaves and fruit smaller than type. Z4. Tree or shrub to 8m; young shoots glabrous. Leaves variable, 5 x 3-15 x 10cm, mostly cordate-ovate, serrate, often deeply 3-5-lobed, scabrous green above, thinly pubescent beneath at first, soon glabrous. Flowers as in Morus alba but with style longer. Fruit 1.5cm, deep red, sweet, setose from styles. E Asia. Z6. TEXAS MULBERRY. Tree or shrub to 6m; shoots nearly glabrous. Leaves 3-7cm, commonly 2-5-lobed or simple, glossy green above, finely pubescent, soon glabrous beneath. Fruit 1-1.5cm, globose to short-ovate, dark purple, sweet. Arizona to W Texas and N Mexico. Z6. 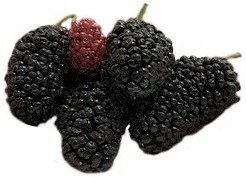 BLACK MULBERRY. Trees to 15m; shoots tomentose, green soon brown. Leaves mostly 8 x 6-12 x 8cm, simple broad ovate-cordate, to 22 x 15cm and often 2-3-lobed on strong shoots, coarsely, often double-serrate, rough scabrous deep green above, paler and pubescent beneath; petiole pubescent, 2cm. Flowers pale green catkins, male 2-2.5cm, females 1-1.5cm. Fruit 2-2.5cm on a 1cm peduncle, green ripening through orange and red to deep purple, sweet, richly flavoured. Probably SW Asia, but extensive early cultivation has obscured range. Z5. RED MULBERRY. Tree to 15m, rarely 20m, dense, rounded crown. Shoots slender, brown, thinly pubescent. Leaves mostly 8 x 6-12 x 8cm, simple suborbicular to slightly cordate (not strongly as in Morus nigra) at base, to 20 x 18cm and often 2-3-lobed on strong shoots, coarsely serrate, rough scabrous dark blue-green above, paler and pubescent beneath; petiole pubescent, 2cm. Flowers pale green, males 2-4cm, females 2-2.5cm. Fruit 2.5-3cm on a 1cm peduncle, green ripening through orange and red to purple, sweet, good flavour. E US, extreme SE Canada. Z5. ‘Nana’: dwarf, slow-growing; leaves smaller, 3-5-lobed.